I know December is here at University of Rochester Calling Center when the student callers are lugging around ten-ton backpacks, the office perpetually smells of freshly brewed coffee, candy wrappers litter the calling areas, and we are sporting colorful winter apparel. 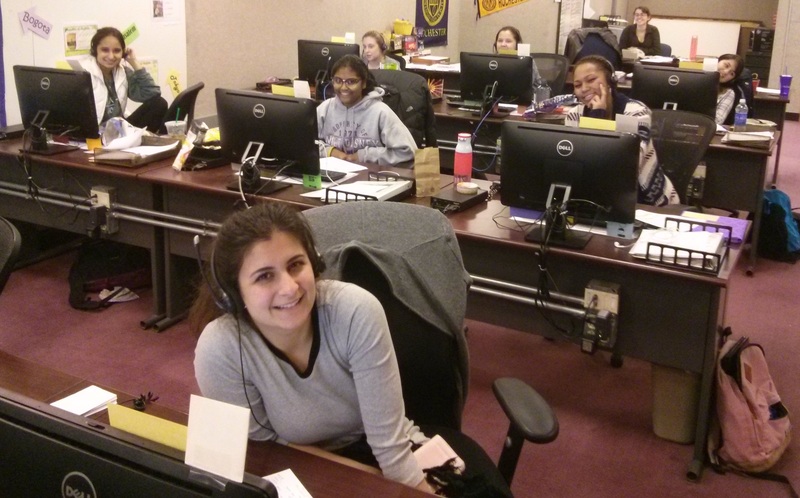 We are working hard to keep our callers energized and round out our calling for the calendar year on a strong note! 1. Track to goals. Make a plan and take action. If you have not already thought about goals that your program should attain by the end of the calling year, this is the time to establish and work towards them. Take a look at how far you are from your goals. What do those goals look like divided per remaining week, day, shift, and hour left of calling? Are they attainable, and if so, what will you do to achieve them? Get down and dirty with your data and advancement team to find records that you might have not attempted in a while and trends for effective year-end record regrouping. Consider adding additional records to be called. Are there records on hold that can be released? Is there a group not previously considered that we have time to reach? Ask these questions and “beef up” your pool of prospective donors before you go into the next semester. Consider hosting shifts at alternative times. You and your staff have been working all semester to reach the same people at the same times of day. Maybe an early morning shift or a late night shift is just what your program needs to get your constituents on the phone. Callers are overwhelmed with final exams and papers, so work should not be another added stress on top of their existing pressures. If anything, make the Center a safe haven from all the craziness they are experiencing this month. During shift, make work fun by prioritizing games, acknowledging great work, telling corny jokes (courtesy of Laffy Taffy wrappers! ), playing happy music, and giving away Starbucks gift cards for use during long nights of studying. This is also definitely the time of year to splurge on sugary treats, meals, caffeinated beverages and fun flavored coffee creamer. If you have a limited budget, consider baking or cooking large quantities yourself to cut down on costs. Additionally, try to avoid pizza as a meal option – there is pizza a-plenty to be found on campus. Instead, go for other food choices that can be found in large portion sizes off of campus like subs. This will assure that you get callers to come to work! Outside of shift times, host a holiday party or organize Secret Santa to foster team building. Hop on the phones alongside your staff and call with them! You are all in this together. Lastly, if you have the space, invite callers to use the Center as a study area during their downtime. They will certainly appreciate a quiet spot away from the madness that is the campus library, and who knows, you might actually get a couple of calling hours out of them! Ensure that your messaging reflects the time of year in which we are in. Use the impending December 31st as a reason to express urgency to secure a pledge. Prepare callers for common seasonal objections to giving that pop up as people are paying off Black Friday and Cyber Monday bills. Use the calendar year end as a reason to get people to fulfill right away on credit cards. Train callers to wish your constituents a wonderful holiday season – a nice touch at the end of a call. Start preparing your spring term scripts. Consider referring to the donor or dollar goals that are public. Put in placeholders and change these numbers right before you start calling in the spring semester after the year-end mail is counted. After calling wraps, be sure to keep in contact with both your staff. Thank them for their hard work in the fall, let them know what the program achieved within the season, offer to send out their statistics for the semester, send out bullets with which they can update their resumes, and get them to commit to their upcoming spring schedules. Consider reaching out to some of your former callers who were a part of the program in the fall. Just because they ducked out earlier in the season does not mean that they don’t care about the program, or that they aren’t thinking about coming back in the future. By proactively communicating with them, you are keeping the door open for their return and also stewarding them for a potential phone call from your very own office in a few years! Good luck to all you telefunders out there! You will rock! HAPPY HOLIDAYS FROM OUR CALL CENTER TO YOURS!